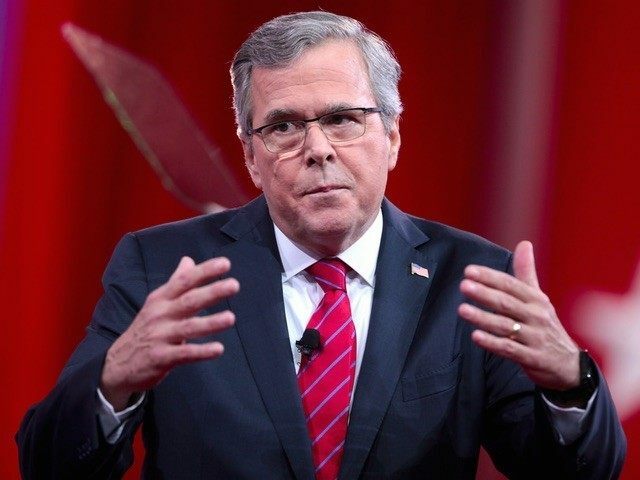 During his latest trip to Iowa, Jeb Bush worked to drum up support for a potential run for president. His struggle to win over the conservative grassroots of the GOP, however, was shown yet again in an op-ed in the Washington Post, in which he attempted to turn both the Common Core standards initiative and a potential reauthorization of No Child Left Behind (NCLB) into strongholds of federalism. “Given all the challenges facing education reform, we need to remember who really should make the decisions about what happens in our schools: state and local authorities and, most important, parents,” writes Bush. The federal government’s role in elementary and secondary education should be limited: It should work to create transparency so that parents can see how their local schools measure up; it should support policies that have a proven record; and it should make sure states can’t ignore students who need extra help. How does a parent who has been working to fight the federally driven Common Core standards – which Bush has championed for the past five years – read these words? Bush’s attempt to infuse his views on education reform with a dose of federalism in order to salvage his credibility with the conservative base seems obvious. Conservatives, of course, would like to see no role for the federal government in education, as per the Constitution. The “patchwork of waivers” is all part of the incentivization program of the Common Core initiative, which Bush has supported wholeheartedly and urged states to adopt. States could obtain flexibility waivers from the federal government’s NCLB law if they adopted the set of “common” and “uniform” standards. As for his statement that the “federal government’s role in elementary and secondary education should be limited,” Bush is late on the scene with that concept, since the Common Core project already involves federally-funded consortia creating tests aligned with the controversial standards. In addition, states were invited to submit applications for federal grant money from Obama’s 2009 stimulus bill (Race to the Top) if they agreed to adopt the standards, and, Obama took credit for Common Core in State of the Union addresses. “It’s as if he hopes the reader will forget that his beloved Common Core is the antithesis of these concepts,” Crossin observes about Bush. In support of his idea that “the federal role should be subservient to the role of states,” Bush points to examples of state-led progress. “Massachusetts passed a reform bill on standards, accountability and choice in 1993 and became the nation’s top academic achiever,” he writes. Ironically, however, the Bay State became the nation’s top academic achiever with standards that were replaced by the federally driven Common Core in 2010, a situation that still strikes Common Core opponents as completely lacking in common sense as well. Neal McCluskey, associate director of Cato’s Center for Educational Freedom, notes Bush’s shift in tone. But looking at the role he lays out for Washington shows how unfettered he would actually have the feds be. Saying, among other things, that Washington should support “policies that have a proven record” opens the door to limitless meddling and control. All someone in Washington has to say is they think their favorite policy has a record they think is proven and – voila! – Washington can force all schools to obey it. And where, by the way, does the Constitution authorize such federal policymaking? Nowhere. Gov. Bush follows his list of justifications for federal power with the assertion that “we are long overdue in setting the lines of authority so clearly.” But not only is his list almost impenetrably murky rather than clear, the lines of authority are already set by the Constitution: the Feds have none in education. Like many Common Core proponents, Bush continues to refer to the standards as “rigorous,” and “state-driven” or “state-led.” No independent studies have been performed to validate the claims that the Common Core is more “rigorous” or “higher” than other standards. In addition, two main private organizations – the National Governors Association and the Council of Chief State School Officers – created the standards and still own their copyright. The project was privately funded by the Bill and Melinda Gates Foundation. While Bush justifies federal involvement in education so that states can be accountable, none of these private groups are accountable to parents, teachers, students, or taxpayers. Bush urges the passage of the ESEA reauthorization based on a notion that it’s as close to federalism as we can get. The current reauthorization proposals in Congress largely punt on any effort to eliminate programs or cut spending. Through the decades and various reauthorizations of the ESEA, dozens of competitive grant programs have accumulated. In fact, some 80 programs are authorized under NCLB today, more than 60 of which are niche competitive grant programs. These programs create a significant compliance burden for state and local leaders, who must apply for program funding, monitor federal notices and regulations, and demonstrate compliance to the U.S. Department of Education. They also represent one of the primary ways in which Washington has extended its overreach into local school policy. Burke joined researchers Williamson “Bill” Evers of Stanford University’s Hoover Institution and a former U.S. assistant secretary of education; Theodor Rebarber, CEO of AccountabilityWorks; Sandra Stotsky, professor emerita at University of Arkansas; and Ze’ev Wurman, former senior policy adviser with the U.S. Department of Education, in a statement asserting their concerns with the ESEA reauthorization drafts.